A welcoming crisp air greeted us as we stepped out of Ataturk Airport. Coming from Dubai where you almost always squint your eyes looking up at the afternoon sky, here it seemed just the right shade of blue. Winter in Istanbul felt wonderful and reaching for the zipper of my quilted jacket brought me a certain unexplainable sense of happiness. Looking out of the taxi on our way to Beyoglu, I marveled at the city’s coastline and lush parks where couples walked hand in hand and friends conversed on the dewy grass. Istanbul’s skyline is remarkably awe inducing; few cities in the world can compete with a skyline that has the majestic silhouettes of the Blue Mosque and Haga Sophia. 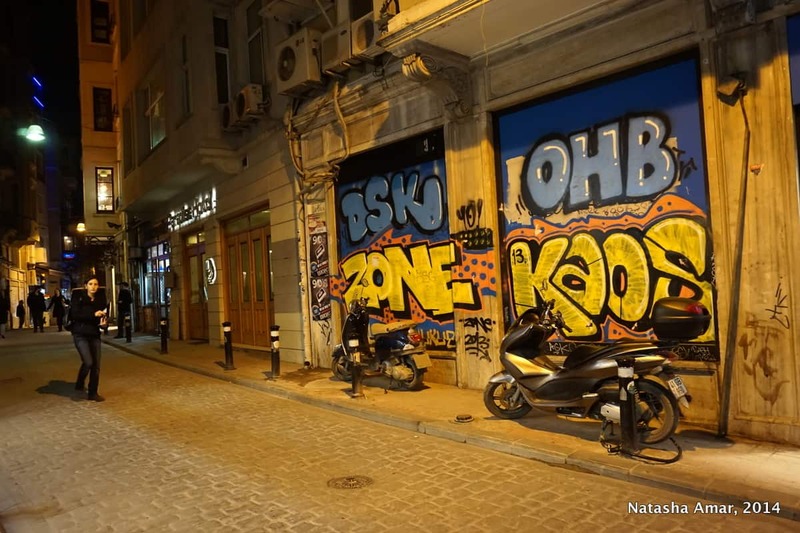 We arrived in Beyoglu, our taxi drove through narrow alleys with walls splattered with bold graffiti art. 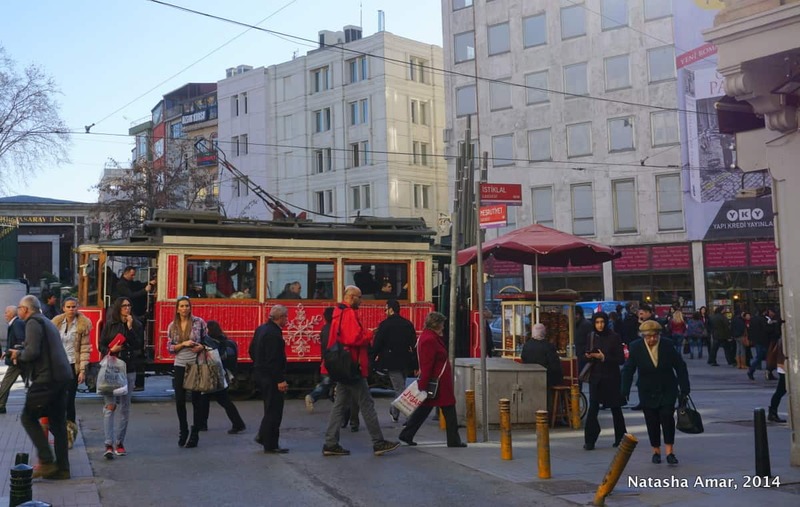 Our hotel was close to Istiklal Caddesi, a street known for being popular with tourists and infamously noisy on most nights. After dropping off our luggage and adding a few layers of warm clothing to our attire, we headed towards Istiklal Caddesi. The sun was slowly setting and winter hours meant that most tourist sights would be closing in the next ten minutes. On our hotel desk’s recommendation, we decided to check out the historical Galata Tower, a 20 minutes’ walk along Istiklal Caddesi. 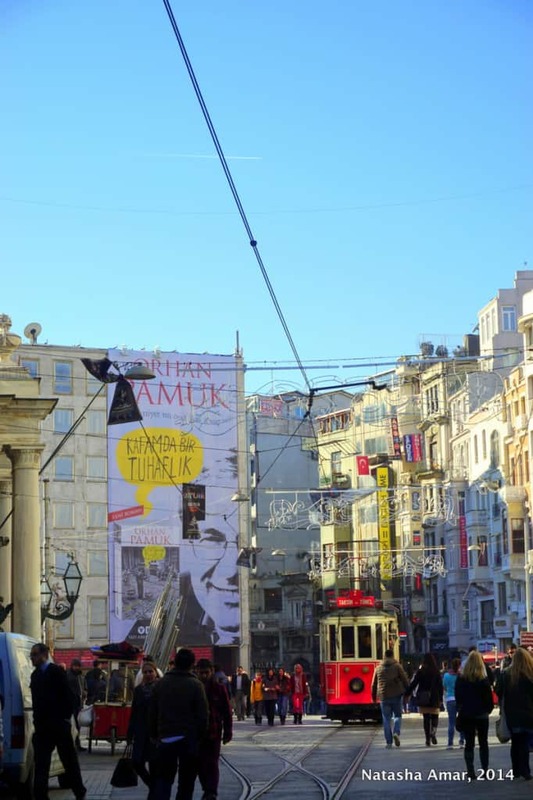 Istiklal Street, lined with fashionable stores, cafés and restaurants was lively and buzzing with crowds of locals and tourists. A small bright red tram packed with people slowly ran through the street sending pedestrians to either side of the street. A cheery Dondurma vendor called out to us as he thump thumped with his long paddle. Every few hundred meters, crowds of people stood around, rubbing their hands together to watch street musicians play their instruments and sing songs of peace, grief and love. These sounds interspersed with the excited chatter of families and the playful whisperings of couples walking by, arms around each other. 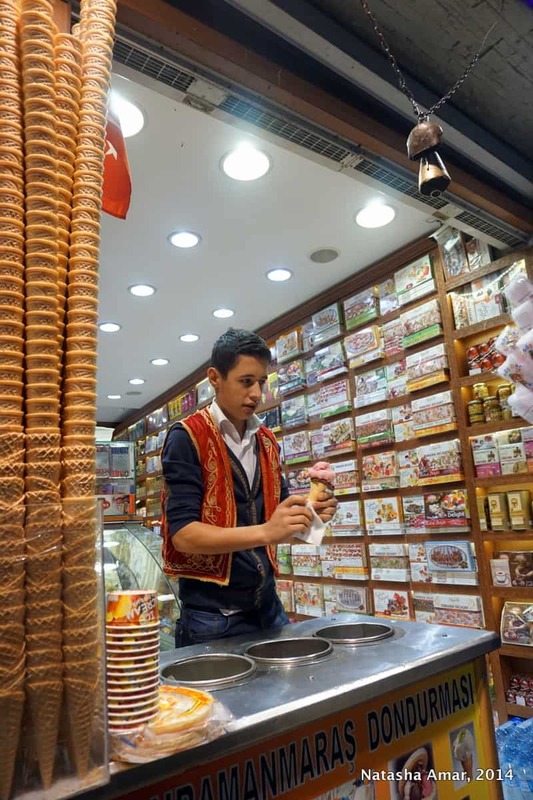 The aromas of kebaps wafted out onto the street causing our stomachs to rumble. Not wanting to slow down and miss watching the sunset from the Galata Tower, we stayed strong and carried on. 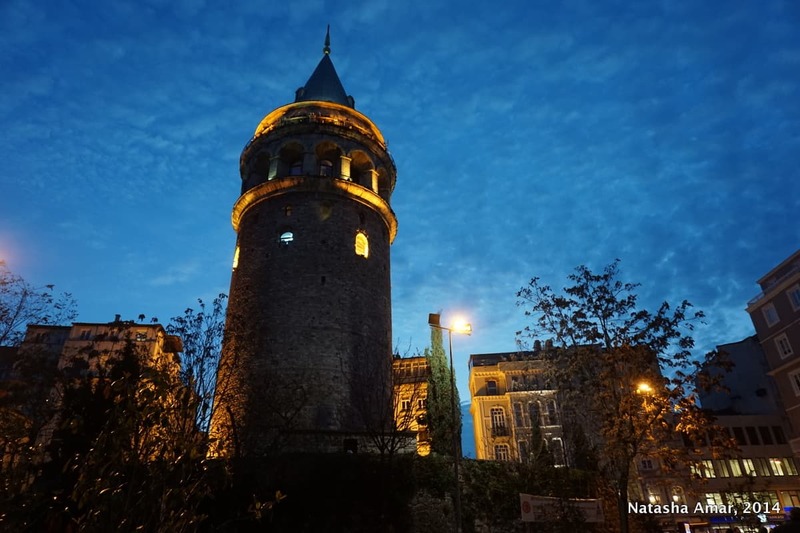 Built in 1348 by the Genoese, the nine-storey and 66.90 meters tall Galata Tower located in the Galata area is an important landmark in Istanbul. Though the observation deck was crowded with people, we managed to find a quiet spot and spend a few moments appreciating the incredible view of the city. The beautifully lit Hagia Sophia, Blue Mosque, Topkapi Palace and the Galata Bridge looked truly magnificent against the night sky. Istanbul can sometimes amaze you with the realization that you’re looking at structures, churches, mosques and other features that serve as a testament to powerful life changing historical events. I experienced one of those moments for the first time that evening at the observation deck of the Galata Tower, drawn in by the views even as I furiously rubbed my chilly hands together. wow! such a beautiful city. How cold does it get in winter? Well, I was there mid December and it was quite chilly but not snowing yet around Christmas. Looks like a really cool place. I had never considered it before but I definitely thing I should go some time soon. 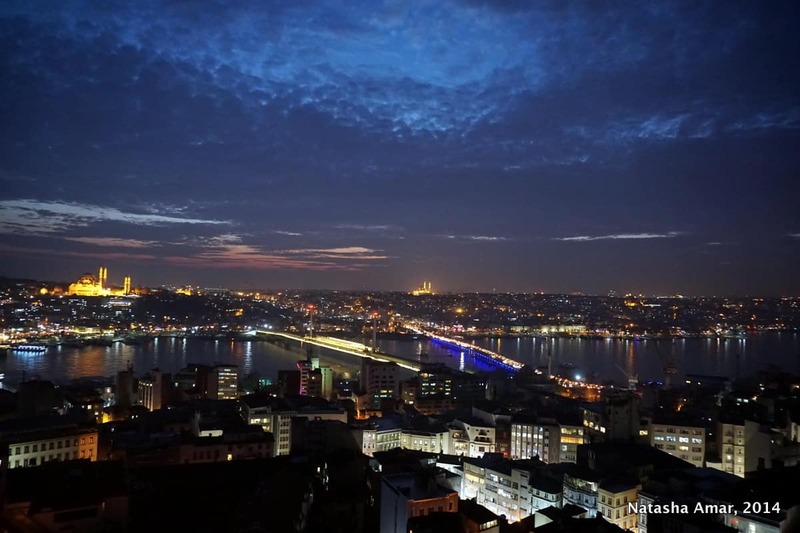 I love seeing these views of Istanbul by evening, they are much different than other pictures I’ve seen! Love the skyline. Thanks so much for linking up with #WeekendWanderlust! What a great view over the city from the tower! Especially with all the city lights. so magical. I haven’t been to Turkey yet, but I would love to explore it. It’s a great place to explore and sure to surprise you with how much the landscape changes depending on which part of the country you’re in! 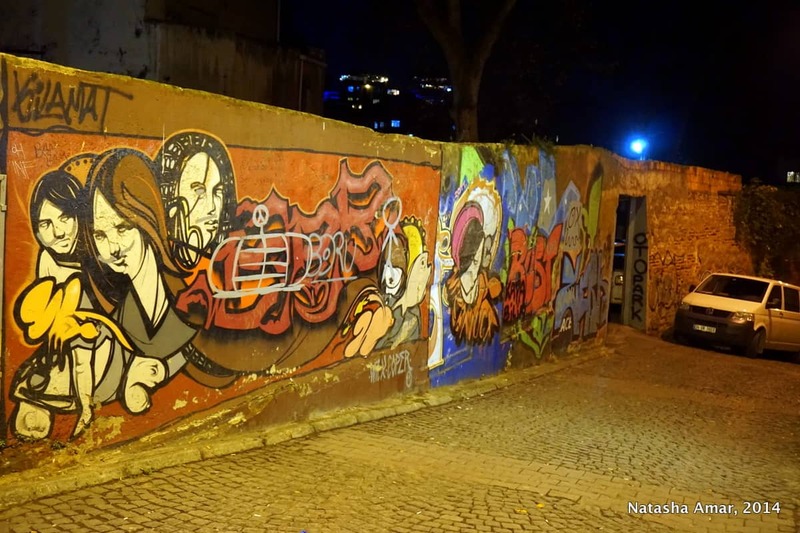 The street art is beautiful – but it definitely looks like a much more inviting place to wander around in the daylight then in your nighttime pics! This brings back so many memories!! We were in Istanbul for 2 weeks in September and we loved the city so much!! I agree that few skylines can complete with one that has mosques. 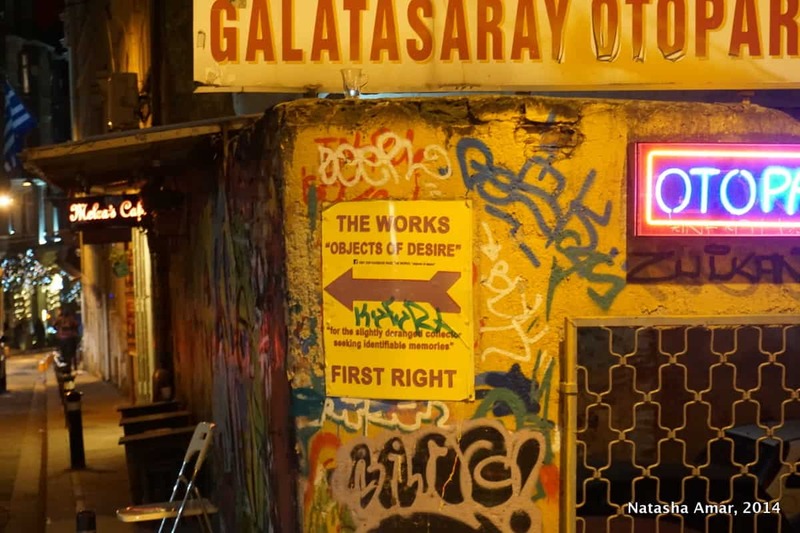 🙂 We also stayed in an little apartment in Beyoglu, just down the street from Galata Tower in fact. But the funny thing is that, because we were so close and saw it everyday, we never got up there!! Your pictures of the view are gorgeous though. I’m glad I can experience it through you! 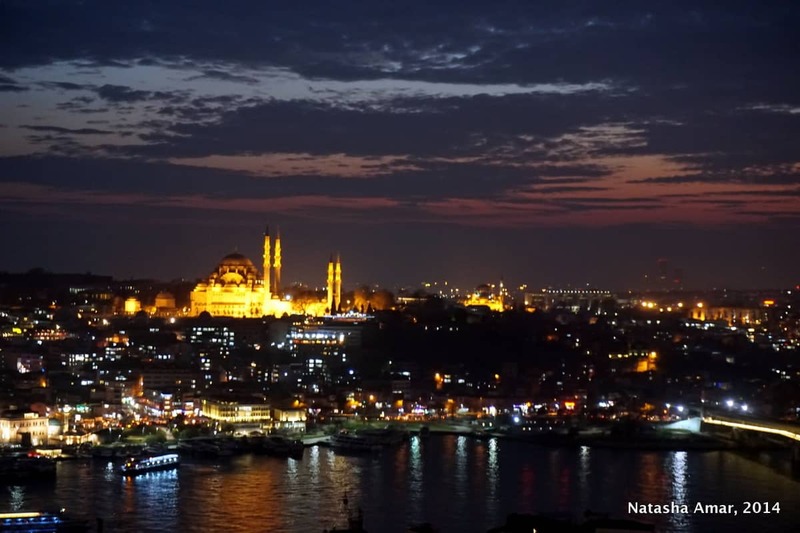 I LOVE Istanbul’s skyline… There’s something so traditional and dreamy about it. I only spent a day there a couple of years ago, but I can’t wait to get back and explore it more! Dreamy skyline indeed! I’m sure you’ll love it when you have the chance to go back.